Do you have questions about your Canvas courses? We have your answers. Bring your laptop and come to the Canvas Walk-In Help Sessions October 23 from 10:30 a.m. to noon, and 2:30 p.m. to 4 p.m. in 203 K-State Student Union. To learn more about Canvas training opportunities, view the training page on the K-State Online Canvas website. 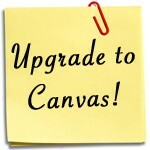 Remember, all K-State courses need to be upgraded to K-State Online powered by Canvas by Dec. 31.